I've been busy testing stain removers, to see which ones actually work, and on what types of spots and surfaces. Here's my list of recommended products I suggest you use, since I've found they work well. Why have I created this section of the site? Because there are lots of products out there promising to remove spots and spills, and it can be hard know which ones work and which ones don't? 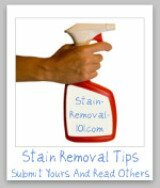 Plus, if your stain isn't removed when you use a remover you may wonder, "does this spot remover work at all, on anything, or does it just not work on the mark I used it on?" If you're ready to begin seeing my recommendations now, click here to skip down to the reviews and recommendations. Otherwise, before I share my list, let me tell you more about what makes certain products great, or totally unacceptable for the job. You should understand, from the get go, that stain removal is more science than art, because removing spots and marks is all about chemical reactions. Therefore, to really effectively remove those spots you need to be using the right chemicals. Now, don't be alarmed when I say "chemicals." Yes, some commercial removers contain what we would consider harsh chemicals, but the term also include such common household items as vinegar and baking soda. Even vinegar and baking soda, for example, have chemical properties, such as a pH level, which effect how they are used for stain removal. Throughout this site I attempt to break the rules for removing spots and stains down into simple terms everyone, even those who slept through chemistry, can understand. 3. The environmental and health impacts of the remover on your family and around the globe. No product or solution you ever purchase or make will treat every type of stain on every type of surface. It's just not possible, so don't believe an advertisement that says it will treat everything. Yes, there are products that work on a broad variety of spots and spills, and it is good to use them when possible so you don't have too many specialty products junking up your cabinets. However, there is never going to be just one bottle of something you'll ever need (as some advertisements claim). Instead, stain removers divide themselves into categories, depending on whether they treat a certain type or types of stains, or what types of surface they can be used on. Therefore, that is how this page is divided too - by general type, which has removers to remove a specific type of spill or spot or for a particular type of surface. Plus, I've also compiled my list of some of the best of class products I have personally found work well. Some products work on a variety of spots, or surfaces (but still not all). The most common of these are bleaches, enzymes, and pretreaters, so I've devoted a whole section of the site here to explaining these types of products, and how they work. All the products I've listed below are all products I personally have used in my home, and have tested and have worked well for me. They are listed in alphabetical order. Next to each recommendation I've shared briefly what types of stains or surfaces I recommend the product for. Further, if you click the link for any of these recommendations, you will see a more detailed review or additional information about the product that I've compiled for you. Amodex Ink Remover - This product is recommended for light ink, crayon and lipstick marks on multiple surfaces. Biz - An enzymatic laundry stain remover great for presoaking a wide variety of protein based and food based spills. Carbona Stain Devils #4 For Blood: Carbona blood stain remover is my personal favorite for removing this tough stain from washable fabric. Dry Cleaning Solvent: It's always nice to have this product on hand, in small quantities, for delicate fabrics, or those fiber surfaces that can't get wet, and I personally recommend Guardsman brand. Goo Gone - This product can be used on many surfaces, and is especially good for sticky, oily or waxy spots and spills. Mr. Clean Magic Eraser - I know when we typically think of spots and spills, we think of those on laundry or carpet for example. However, you can get marks and scuffs, as well as stains, on hard surfaces too. One of my favorite products to remove those types of marks is this Magic Eraser. Oxiclean Reviews And Uses - This product is also another broad-variety presoaker for many types of laundry stains. It can also be used for cleaning and removing spills and spots from other areas of your home too, including certain hard surfaces. It's really been amazing how many uses I've found (or readers have shared with me) for this product. Stain Rx - Recommended for removing iodine, berry, blood and red wine from fabrics and fibers. Share Your Own Reviews With Me And Help Me Discover The Next Big Thing! I learn so much from readers who write in to share their reviews and recommendations of various products with me. 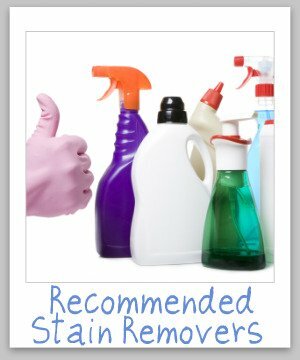 It has helped me find some new recommendations for you, and also they've experienced some stain situations I have not, which allowed them to test products in ways I haven't yet encountered. If you've got a favorite product, or tried something that ended up not working well for you, either way I'd love to hear from you. You can share your own reviews here, or read lots of reviews that readers have already shared and I've put up on the site.